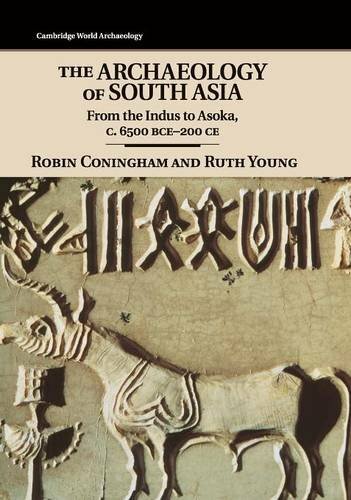 Robin Coningham (Durham University) and Ruth Young (University of Leicester) offer a critical synthesis of the archaeology of South Asia from the Neolithic period (c.6500 BCE), when domestication began, to the spread of Buddhism accompanying the Mauryan Emperor Asoka's reign (third century BCE). Rather than a chronological narrative, the authors present the vast regional and temporal scope of their research through a site and regional-based approach, which, they argue, enables them to make comparisons of the two urban-focussed developments of the time - the Indus or Harappan civilisation and the Early Historic or Indo-Gangetic civilisation. They assert that using this approach does not preclude engaging with the vital networks and connections that these settlements and communities were a part of. The authors examine the growth and character of the Indus civilisation, with its town planning, sophisticated drainage systems, vast cities and international trade. They also consider the strong cultural links between the Indus civilisation and the second, later period of South Asian urbanism which began in the first millennium BCE and developed through the early first millennium CE. The authors explore how narratives of continuity and transformation have been formulated in analyses of South Asia's Prehistoric and Early Historic archaeological record. The archaeological evidence across sites is presented to demonstrate patterns of regionalisation and differentiation, as well as integration and subsequent transformations to localisation. The book is organised into chronological sections, each of which is further broken down by region and/or site. Part I sets up the contexts - methodological, environmental, cultural and historical. Part II investigates the Indus Valley tradition (c. 6500 - 1900 BCE), and Part III the Early Historic Tradition (c. 1900 - 200 BCE). Part IV presents the conclusion and challenges. Visual aids such as comparative timelines, maps, plans, diagrams, and photographs (black and white) are generously woven through the chapters. Key concepts and exemplars are highlighted in boxes, and references abound. The authors also clearly define the concepts they employ in the introductory chapter. These aspects, along with a clarity of presentation, clearly position this as a textbook or teaching aid. This book aims to challenge the general perception that the transition between these two urban-focussed developments was marked by discontinuities, migrations and invasions, and instead reasserts the importance of reframing the archaeological data to demonstrate the transitional continuities and connections.